Electrical safety certificates and regular electrical testing is crucial for the safety and reliability of appliances. All landlords, homeowners and businesses must operate safe and secure electrics. The best way to achieve this is to gain a detailed inspection by a qualified electrician, such as those accredited by NICEIC. But what are the major methods used to check the electrical system is safe? You can find an overview of all NICEIC certificates here. 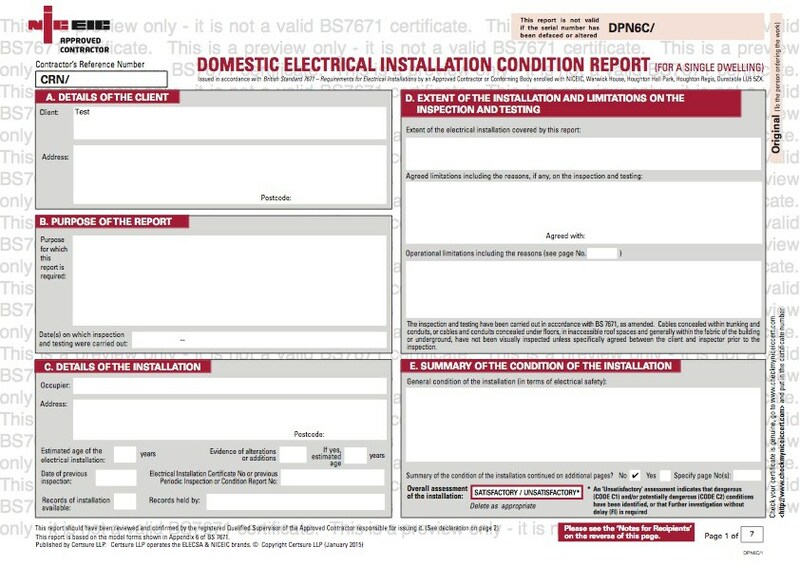 An Electrical Condition Report involves gaining an inspection from a qualified electrical engineer. This ensures the safety and reliability of wiring and electrical appliances. If any damage is identified, it will be highlighted for repair. If all the wiring and appliances are in good working order, the engineer can issue a certificate, certifying the system. It is recommended that commercial, domestic and landlord property owners get a EICR on a regular basis (usually every five years). Portable Appliance Testing (PAT) is a method used to check portable appliances are safe to use. This can include checking the safety and reliability of appliances such as toasters, kettles, microwaves, and similar devices. A reputable electrician will be able to test and reschedule checks for a future date, usually once a year. They will also be in a position to provide helpful advice on how to keep electrics safe and reliable. Fault finding is another method available to judge the reliability of a property’s electrics. Qualified electrical engineers can undertake careful examination of the entire electrical system, helping to identify faults or other areas of concern. If any faults are identified in terms of wiring, sockets, the control gear, switches, the fuse box, or other electrical devices, they can be scheduled for repair or in some cases, completely replaced. Ongoing testing and maintenance is vitally important to ensure the safety of properties and also to increase the longevity and reliability of the electrical system. By undertaking regular checks, business owners, landlords and homeowners can ensure safe and reliable electrics for years to come. Every year, electricians and electrical engineers must ensure their qualifications are valid to reflect the latest changes in the law. The British Standard for wiring regulations (BS 7671) is due to be updated to include a number of new system aspects to be aware of. This will apply to both domestic and commercial properties within the UK. These new aspects include surface heating, fire protection systems, energy efficiency, overvoltage protection, and will also cover a number of other considerations as well. As such, it is important that all electrical engineers keep updated with the latest changes to provide the maximum amount of safety and efficiency possible. If you need a gas safety or electrical safety service do not hesitate to contact us. Did you enjoy this article? We would like to hear from you in the comments section below.